This morning, vegan protestors disrupted the country, stopping traffic, annoying the police and forcing the Prime Minister to comment. I have a problem with this. A couple of weeks back, a group of vegan activists stormed a farm in rural Queensland. The media outlets shouted militancy, illustrating the angry statements by the farmer. It was trespass, it was activism, it was probably both. As a farmer myself, I’ve come to my own conclusions. As the industry is small, we tend to talk, so we’ve discussed this amongst ourselves. It’s easy to pick a side, which is what we’re for. I have two issues with this. First, Scott Morrison is wrong, as there’s nothing more us than unison protest. Second, the objective nature of the conversation (farmers vs activists) allows you to twist both parties into what you need them to be. Using the example of Morrison, we farmers are the victims, the activists, the problem. We are not, and neither are they. A couple of years back, protestors came to my property, armed with placard and repeated slogan, looking to make headlines, or perhaps trouble. I assumed that was certainly the vibe. Now, I grant you that it is infuriating to try and converse with someone who is busy hearing themselves talk, or worse, who chooses to talk over you with the same repeated statement, but once we looked beyond that (or endured it), it became a matter of conversation. 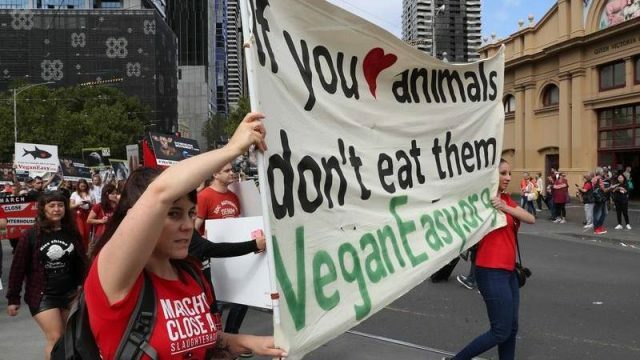 It may be easy to judge solely relying on the headlines, what with animal activists dumping blood on celebrities, or with PETA shitting on the grave of Steve Irwin, but that’s certainly part of the problem. They’re only a problem if you make them a problem. Those kids asked to be shown around the farm, I could have said no, but I had nothing to hide. They took photos, they asked questions, they wanted my take on the industry, they wanted to know how I felt about animals. I told them. We shook hands and parted. The trouble, I believe, is in the aftermath. When cost is measured, and points must be scored. Media agencies need headlines, the protestors need to register their event as a win, politicians need to advance their career. Even we farmers feel the need to twist the narrative. I certainly did, thinking that I taught those kids a lesson. It’s an easy trap to fall into, but if we remove ego from the situation, and indeed, what we’d like to personally gain, we see the truth. These people are just that. People. They’re standing up for what they believe in. That is perfectly fine. We all have the right to protest. So, if you consider demonising these people, casting them off as either crazy, unwell or entitled; the target of their criticism says that you need to let them have their say. We don’t need you fighting our battles for us, and that goes for you too, Scott. William Crockford is a farmer from country NSW. He had two kids and three dogs, and prefers the latter.